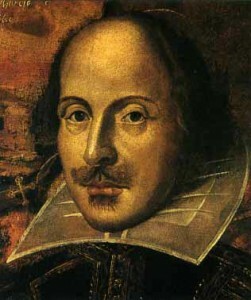 Shakespeare’s writing contains all manner of religious and spiritual references but he advocates the application of none. He claims to hold the ‘mirror up to man’ and what does he reflect? A meaningless universe, a tale full of sound and fury, signifying nothing (Macbeth). His greatest heroes could well be operatives of a dark God (Hamlet, Lear, Othello, Macbeth), and his heroines are oriental seducers (Cleopatra), the most chilling murderess in English literature, Lady Macbeth, doomed submissives like Ophelia, Cordelia, and Desdemona and an assortment of monsters – Regan, Goneril, the witches in Macbeth. Macbeth is a seminal event in the history of the demonizing of women – but I have found no feminist literature on it. No legacy is so rich as honesty yet despite having the evidence in front of our ill focused eyes the beacon of the wise has dwindled to a pale flicker. To get to the quick of the matter (there is no darkness but ignorance) – where in Shakespeare do we find the true saviours of society, the saintly priest or holy man and the noble ruler who works for Mind and Spirit as well as the physical well being of his subjects? They are completely missing. Knowledge is the wing wherewith we fly to heaven but in this tawdry scenario one is tempted to think that hell is empty and all the devils have arrived here. Friar Lawrence pops up and attempts (a thwarted) good deed in Romeo and Juliet and there is the paternal, fantastical figure of Prospero in the last play The Tempest – but was this Shakespeare’s final attempt to salvage his conscience after having let slip so much bloodshed and madness earlier in his career? Why does the Prospero figure appear in a fantasy? Benevolent rulers and holy men and women have rescued society all through history though history writer’s predilection for villains gives us scant awareness of them. Our subconscious is disastrously unfamiliar with their presence and much of the blame lies with the literature imposed on us. ‘say well’ and yet words are not deeds. And as you keep rereading the plays you cannot help thinking; words, words, mere words, no real matter from the heart. It is a truism of course that the devil can cite Scripture for his purpose and Shakespeare has been used by British imperialism as the imprimatur for all manner of imperialist aggressive appropriation. The general gist of the Anglo argument being: “Your culture never produced anything as marvelous as this so that gives us the Darwinian right to do with you as we will”. And the bloodiest Empire in history was launched and still continues to hold sway in parts of the world it has no right to be. They looted with efficiency, ignoring or not knowing that there were writers equal to or superior to William S. in the lands they exploited. The likes of Kalidasa and Rumi, exempt from public haunt, were excluded from the text books, and by that sin fell the angels of common sense. Millions of brown sahibs, forced to drink down all unkindness, grew up with a sense of deep cultural inferiority. We looked towards Oxford and Cambridge, not aware what man may within him hide though angel (to our brainwashed eyes) on the outward side! The object of art is to give life a shape and the life-force that is the art of our homelands was summarily dismissed. We know what we are, but know not what we may be and its high time we examine our own heritage and bring hidden treasures to the light of day. We cannot conceive of matter being formed of nothing, since things require a seed to start from; not only do we have the seeds, we have veritable forests of enlightenment and sophistication ready for regrowth and wonderful new planetary hybrids. I protest too much. Of course I do not really want people to stop reading the Bard. There are too many celestial and dramatic delights one would miss out on. As Aldous Huxley has pointed out no one in the English language touches the high points as constantly and with the parlous state of poetic language as it is in the West it is imperative that William is still used as a template and inspiration for young writers. But stay aware. Has it passed your notice that nineteen full quotes from Shakespeare have been used in this little missive and most of the readers are from countries where English is not the mother tongue? That’s ultra successful colonialism for you!